Dexion Racking Archives - Shelving & Racking Ltd.
Dexion Racking and so much more. Dexion racking is probably the thing that we are asked for most often. 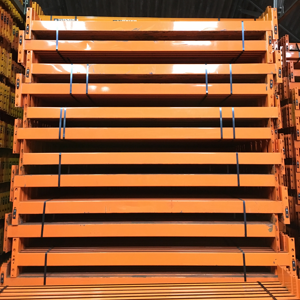 However, Dexion is just one of many used pallet racking systems that we have in stock in a wide range of sizes and duties (and even Dexion has 2 different racking systems- Dexion Speedlock and Dexion P90). We also have Apex, Redirack, PSS and Link 51 pallet racking, and often some of the less common systems such as Hilo, Stow, Mecalux and Esmena. 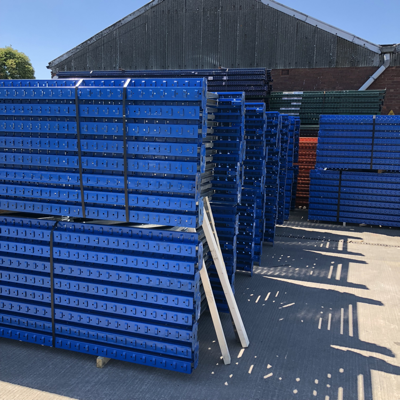 Used warehouse racking is usually supplied for pallet storage, but adding wire mesh or timber decking can easily make it suitable for heavy duty hand loaded shelving. 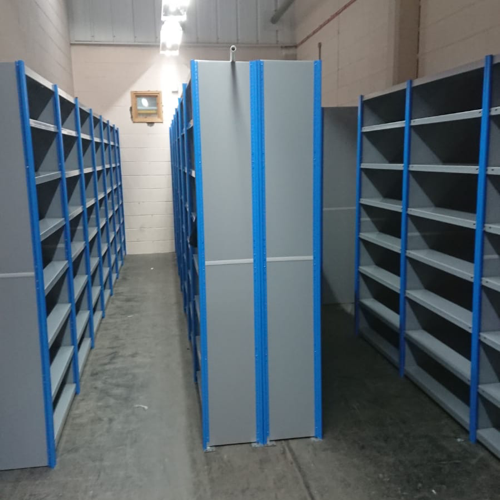 We can also supply multiple runs of back to back racking to be used as carpet racking or adjust the depth and height of the frames to create bays of tyre racking. We have recently delivered racking similar to that it the photo to customers in Hull and Birmingham. Whichever type of industrial racking or warehouse shelving you need, please give us a call now on 0800 612 3210 or send us a brief description on an enquiry form and we will reply to you quickly. 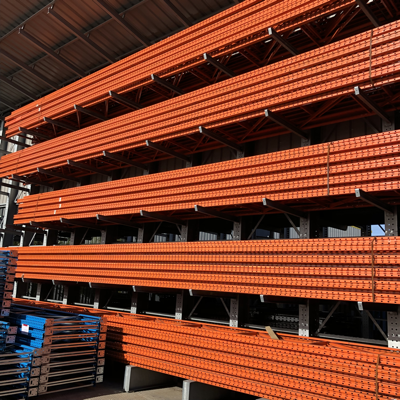 Used Dexion racking is consistently our most requested warehouse storage system and so we make sure we always have an extensive range of sizes and duties available to cover all enquiries. 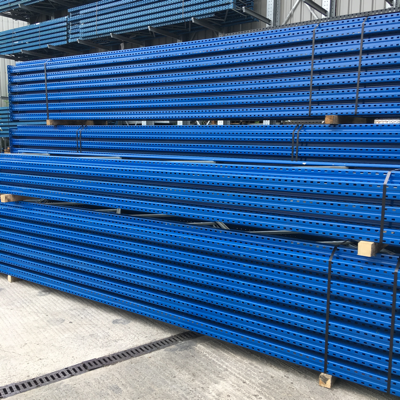 We can supply frames from 2000mm to 9000mm high and in standard metric (900mm or 1100mm) or imperial (3ft or 3ft 6in) depths, or bespoke for your specific requirements. 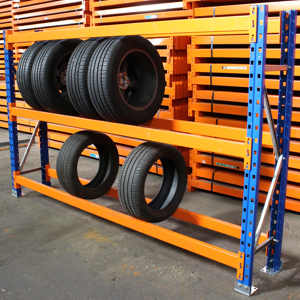 All our industrial racking frames are supplied assembled and with footplates attached. 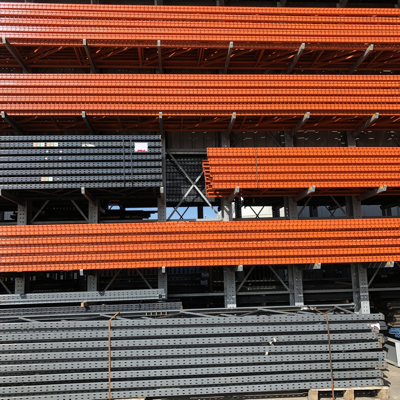 Dexion beams are also common in both metric and imperial sizes. 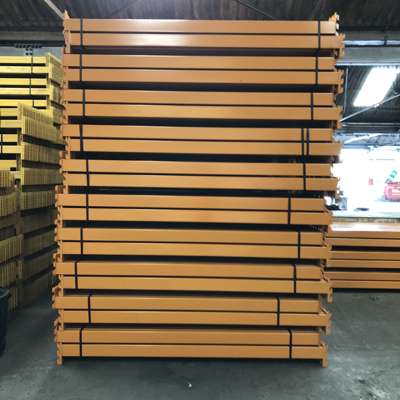 We currently have large amounts of 2438mm (8ft) and 2667mm (8ft 9in) beams but we also have popular metric sizes (2700mm and 2300mm) and we can almost always find the right solution for any warehouse racking enquiry. Our pallet racking beams are supplied with beam locks as standard. Our fantastic discount structure is based on the total value of you order and we will always do all we can to beat a like for like price. Call us now on 0800 612 3210 to tell us what you need, or send an enquiry form and we will get back to you quickly.